1. In large skillet, cook apples, honey, cranberries, cinnamon and ginger over medium-high heat 15 minutes. Reduce heat to medium and cook 5 to 10 minutes longer or until any liquid evaporates and apples begin to brown, stirring frequently. Refrigerate 1 hour to cool. 2. Meanwhile, in food processor with knife blade attached, process brown sugar and pecans until pecans are finely ground; stir in graham cracker crumbs. 3. Preheat oven to 375°. In small microwave safe bowl, heat butter in microwave oven on high 30 to 40 seconds or until butter melts. On 18-inch long sheet of parchment paper, layer 3 sheets phyllo dough; brush with some melted butter, then sprinkle with 1/3 of the pecan mixture. Working quickly, repeat layers 2 times with remaining phyllo sheets and pecan mixture. Starting at long side of phyllo closest to you, spread apple mixture over bottom 1/3 of phyllo rectangle, leaving 3/4-inch border at bottom and sides. Starting at long side covered with apple mixture, roll phyllo to enclose filling, using parchment paper to help lift phyllo. 4. 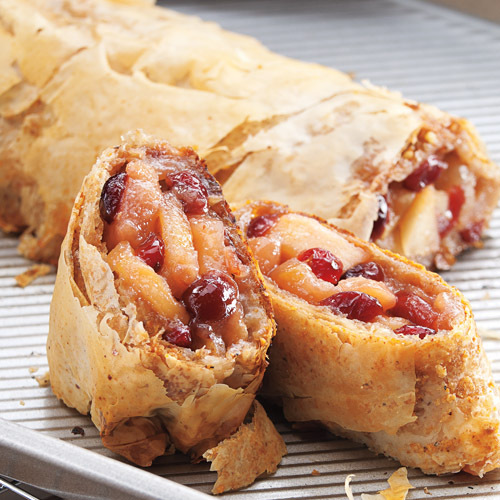 Place strudel, seam side down, on rimmed baking sheet. Brush with remaining butter. Bake 35 to 40 minutes or until golden brown. Cool 15 minutes before cutting diagonally into 8 slices.